Super lightweight prospect Mykquan Williams takes the next step in his young professional career as the 20-year-old sets his sights on capturing his first regional title when he takes on Orlando Felix (12-1-1, 4 KOs) of Puerto Rico for the WBC USNBC silver title at the Foxwoods resort in Mashantucket on May 5. This is considered a step-up bout for Mykquan (10-0, 6 KOs) as the winner of this fight will be rewarded with a ranking in the WBC’s top 40. But the young prospect from East Hartford doesn’t seem to be fazed at all with the established record his opponent brings and admits he doesn’t know too much about him. Mykquan has been boxing for 12 years and had 58 fights in the unpaid ranks, but how would he describe his style to the fans that have yet to see him? “I would say I’m more of a counter puncher, very fast, and just smart overall. I can be aggressive, but I’m not overall,” he said. Mykquan was only 7 years old when he was first influenced by his aunt who was also professional fighter to start training as a boxer. His aunt would later introduce him to his now trainer Paul Cichon that would eventually begin his journey to becoming a professional prize fighter. “I went to go see one of my aunt’s professional fights at the Convention Center in Hartford and then after that fight I told her to take me to her gym. “At the time she was training with Paul, so then a little after that she took me to the gym and she introduce me to the Paul and I’ve been with him ever since,” Mykquan said. Mykquan admits that it took him awhile to fall in love with the sport and to figure out if this was something he wanted to pursue as a career. “I knew I liked it (boxing) but it took awhile. I was young, I was only 7 going on 8 years old and kids that age they don’t know what they want to do and they don’t know what they really like as far as sports go, so I just liked the sport and kept going back every day to the gym. “But it took me a little awhile to actually to start to love the sport and figure out whether that’s what I’m going to be doing as a career,” he said. Growing up in East Hartford, there were temptations that could’ve swayed him away from his path but the young East Hartford native credits his family and his coach for keeping him on his path and pushing him to keep working hard, to stay in the gym and stay out of trouble. He would eventually meet Jackie Kallen, who would eventually sign on as his manager and is currently guiding his professional career. “I first met Jackie years ago. My trainer flew her in for her to be a special guest at one of his big amateur dinner shows he threw. 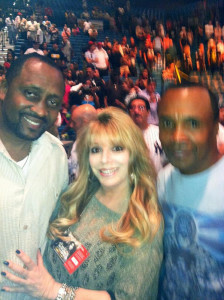 “And I was fighting on the card and he (Paul) wanted her to see me fight because he knew I was going to go pro. He introduced me to her when I was probably like 13 or 14. “She’s a great manager, she does her job good, and she’s a great lady. Definitely somebody that’s good to have in your corner. She’s been around boxing for so long and knows so many people,” Mykquan said. The 20-year-old now has a strong supporting cast with the services Jackie Kallen as his manager and with Lou Dibella as his promoter that will help guide him to the promise land, which is his ultimate goal of becoming a world champion. But the young prospect from Hartford is only focused at the task at hand and taking it one fight at a time and is not even thinking about the killers at the top of the talented rich super-lightweight division. “We’re taking it one fight at a time. We don’t want to rush nothing; we just want to focus on the task in front of us. “I don’t worry too much that’s in the future. I try to take it one step at a time, but there’s a lot of good talent at 140,” he said. 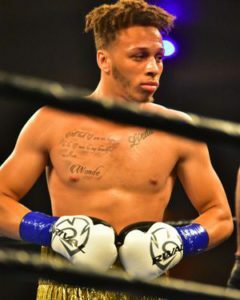 Mykquan has came a long way since he first started boxing and is still continuing to learn and getting a better understanding of the boxing business. He’s looking forward to his next fight and doesn’t have a prediction of what will happen, but he does plan on winning. “I just want to go out there and dominate and be victorious,” Mykquan told me. “I don’t care if I get the knockout, it’s a decision or whatever, I just want to look good and come out with the victory. “To everybody out there that supports me, just continue to support me. I fight for you guys and I appreciate it,” he said.